The Plum Card from American Express OPEN currently has an Informr score of 7.5 out of 10. This score is based on our evaluation of 14 sources including reviews from users and the web's most trusted critics. Plum Card from American Express OPEN is typically available to those with good credit scores (650 or greater). The Plum Card® from American Express is a good fit for those who want a business charge card that allows them to save 1.5% each month. The annual fee is a little pricey, but it is waived the first year and the card could be more than worth it depending upon your business. This card makes sense for businesses that need wiggle room on their accounts payable. Others should look for a straight-up rewards card. Will work best for businesses that have a high and predictable cash flow and can easily accommodate immediate balance payments. It will not work for businesses that are looking for a cash flow management tool. Nor will it work for businesses that have low or irregular revenue streams. - No interest charges because you pay your balance in full each month. - Get a 1.5% early pay discount with no cap. At first glance, the only setback this card has is the annual fee of $250, which is waived for the first year. But if you take into account that it lets you delay your payments without paying an APR, which can cost anywhere from 12% to 22% variable, then the money you save may outweigh the annual fee. A different kind of card, giving small business owners a lot of flexibility when it comes to paying it off. If you’re not sure when you’ll have the money to pay your bill, this card provides some wiggle room. 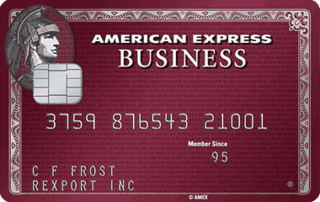 The Plum Card from American Express OPEN is best for established business owners with good credit that are looking for expansion. With the adjustable spending power and the deferred payment option, this card can help with your cash flow. If you have the type of small business where your cash flow each month can vary wildly, The Plum Card from American Express offers some incentives to help keep your bills under control. Although it doesn’t come with some of the features you get with other business cards, this card could still be worth carrying if you can pay your balance in full and pay at least your minimum monthly payment within 10 days of your statement closing date. It seems that this card only has a few drawbacks such as the $250 annual fee. It does, however, come jammed packed with benefits and rewards that make it well worth your investment.